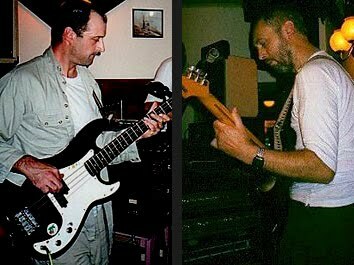 I began working with Don Miucci (bass guitar) in 1998 in the three-piece Vibe Warriors. We decided to continue as a duo after the departure of our drummer. In 1999 we were using an Alesis SR16 drum machine but then decided to go for a bigger, more arranged format using a Yamaha QY22 sequencer. This provided a great supplement of sounds - piano, organ, strings and even a brass section on some songs! Although we were playing mainly cover versions of fairly well known material, Bowie, Sting, Dire Straits etc, many of these were all-new arrangements, just loosely based on the originals. This was a great opportunity to develop new skills in producing a different sound to what we had in mind at the beginning - and it took two years before we had enough material to take it on the road. This is why the mission statement 'Covers Jim, but not as we know them' became our slogan. The sound was built around the Zomax 15-inch bass bin with its distinctive woody sound. The highlight of the four gigs we played in St Just was definitely Lafrowda Day on 21 July 2001 - some party!